Home Drama Cosmic Girls surprise Bona with a food truck! Cosmic Girls’ members visited ‘Girls’ Generation 1979′ set to cheer for Bona. 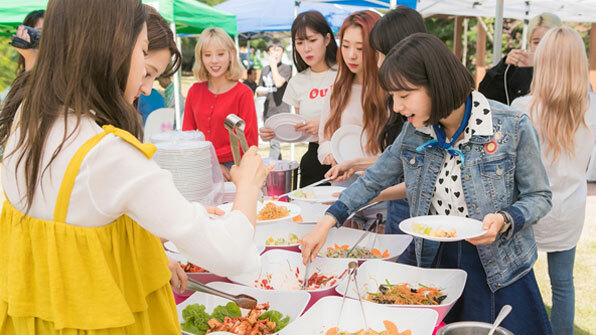 On September 3, Cosmic Girls showed up at the drama set with a food truck to cheer for their member Bona, who plays the female lead, Lee Jeonghui. In order to surprise Bona, the members were hiding behind the table and appeared when Bonaapproached. Bona screamed out of delight and shock as the members hugged her. ‘Girls’ Generation 1979′ is a comic romance drama that features the love and friendship of the high school girls in Daegu. ‘Girls’ Generation 1979′ premieres on September 12 on KBS World! Next articleKang Ha Neul and IU deny dating rumors.